A group of three University of Illinois Springfield students took part in the sixth annual Campus 1871 event, a weekend-long initiative hosted by Chicago-based 1871, a non-profit digital startup incubator, which simulates the realities of launching and running a startup company. 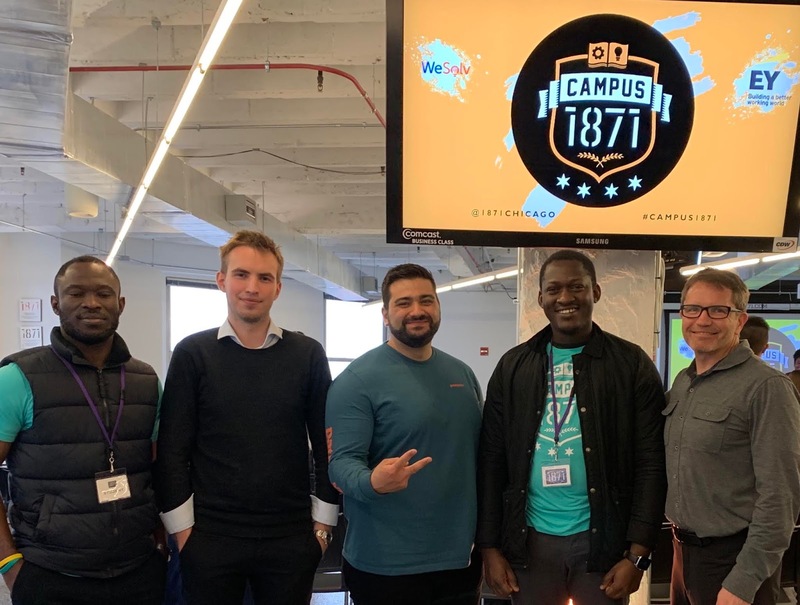 The event was held April 6-7, 2019 in Chicago. For one weekend a year, 1871 brings together more than 100 students from local universities for the ultimate startup experience. Students come together to share ideas, collaborate and build out business solutions with mentoring and coaching from 1871 entrepreneurs. The weekend concludes with a pitch competition in front of a panel of top leaders in Chicago’s tech community for assorted prizes. The three UIS students who participated included Nikita Newcomb, an undergraduate business administration major from Russia; James Ukonu, a graduate data analytics major from Nigeria; and Olamide Ogunbameru, a graduate computer science major from Nigeria. Newcomb and Ukonu’s team took first place in the business solutions track and Ogunbamer's team took second place. There were a total of 11 teams who competed. Founded in 2012, 1871 was created to support Chicago’s digital startup community. Since that time, it has become the hub for the city’s thriving technology and entrepreneurial ecosystem. Located in The Merchandise Mart, 1871 is the home of more than 400 early-stage, high-growth digital startups.